Nestled between Nar and Narayan, the Mountain ranges and in the shadow of the Nilkanth peak at a distance of 301km to the North of Rishikesh, Badrinath is the majestic town that showers the devotees with the ultimate blessings of the Lord Vishnu. Located in the Chamoli Gharwal district of Uttarakhand State at an elevation of 3133mts above the sea level, Badrinath Dham is an all-famous Shrine that holds the most important position in the Chardham Yatra being one of the four dhams. Every year, lakhs of devotees turn around to visit the sacred town of Badrinath Ji that is positioned on the left bank of Alaknanda River and to bow their heads in front of the auspicious Badrinath Temple. Badrinath Dham also own the place among the four pilgrimages centered in the four corners of India. They all are placed as Badrinath (Badrikeshwaram) in the North, Rameshwaram in the South, Dwarkapuri in the West and Jagannathpuri in the East. As per the mythological strand, Badrinath had also gained fame being the part of Panch Badri. 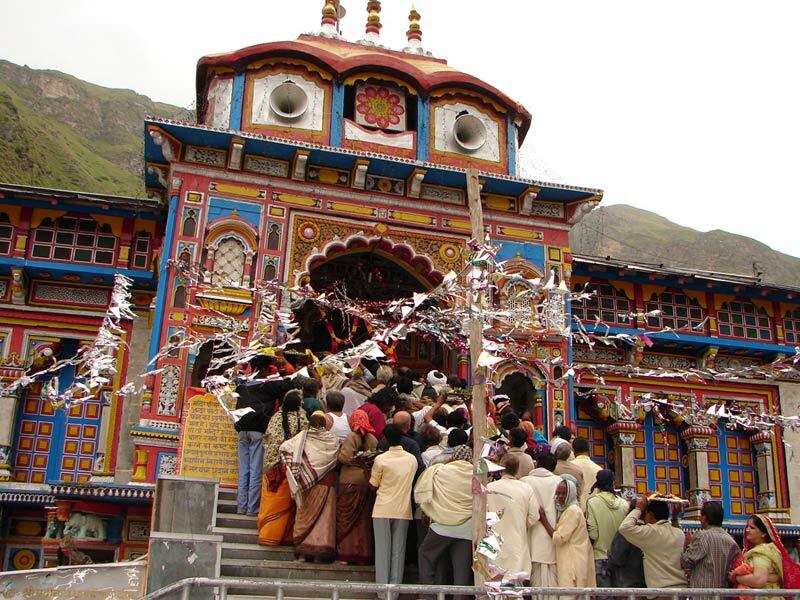 Badrinath holds a great significance in its historical embodiment. A lot had been spoken and written for Badrinath pilgrimage Yatra in its legendary history. Badrinath pilgrimage tour not only offers the sacred shrine and journey to attain blessings of the almighty. It do offer captivating view of the snow clad mountains along with the mesmerized landscapes of the Gharwal region. 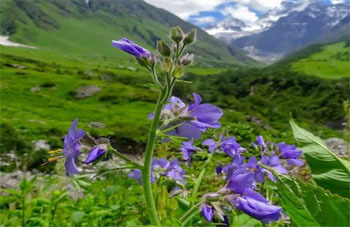 Visitors visiting Badrinathji town can enjoy the undulating peaks, sacred water bodies and unparalleled recreational activities and make the trip memorable. Historical captures of the tirtha Badrinath Dham takes you to several stories. Among them, the first and the foremost one lies with the derivation of its name Badri that holds the meaning of a wide berry. According to the sources, when Lord Vishnu sat on penance on the mountains, Goddess Lakshmi transforms herself in a berry tree and provides shadow to the Lord against the harsh sun rays. In several purans also, the significance of this famous shrine is described. Likewise in Skand Puran, it is mentioned that shrine like Badrinath holds no comparison in today’s world. It carries an incomparable presence on the Earth. As per the mythological stories, Badrinath shrine is also referred as Badri Vishal that was renowned to encounter the reestablishment done by the Adi Guru Shri Shankaracharya. He had done the process of reestablishing this great shrine with the purpose to reunite the lost glory of the Hinduism. Along with it, the mythological stories encapsulate the renowned tale of Pandav brothers who hailed the Badrinath way towards their journey to Heaven. It is believed that Pandav along with Draupadi took the way Swargarohini peak that lies near Badrinath Yatra and Mana village. The legendary site of Badrinath Shrine also recives the footfall of some of the great sages of Yore. To name a few, we have Kapila Muni, Kashyap and Gautam. These sages have performed the penance here and attain the salvation. The serene Shrine of Badrinath acknowledges a cool and chilly climate all throughout the year. Weather in winters: Winter season in Badrinath falls between October and April. During the whole season, the temperature touches the minimum level of 5 degree Celsius. Even the area is prone to face zero level temperature and even vigorous snow fall. For visiting the shrine, the winter season is strictly avoided. Weather in summers: Visitors can enjoy the pleasant journey during the summer season that hailed between May to June. The area experiences a moderate cold climate with an average temperature of 18 degree Celsius. It is the highly recommended period to pay homage to the holy pilgrimage of Badrinath and to attain the blessings of the almighty. Weather in monsoons: During the months of July, August and Mid September, the pilgrimage area of Badrinath receives high rainfall. Also, the area experience a fall down in the temperature to 15 degree Celsius. During this season, there lands a high risk of landslides that makes the travelling difficult. According to the sources, the best time to visit Badrinath Shrine and Badrinath temple is during the summer season between May and June and between September and October. Summer season is the most crowded season followed by most pilgrims. However, for a relaxed journey, you can prefer the September and October time period. Avoid the area during monsoon as you may face serious risk of facing landslides and related issues. By Air: Located at a distance of 314kms is the nearest airport to Badrinath i.e., Jolly Grant Airport. This airport holds the lines with other metro cities of the country. Also, you can get the motor able way to reach Badrinath from the airport. By Rail: The nearest railway station to Badrinath is Rishikesh that is located 295kms away. This railway station receives linkage with the other railway streams located in other parts of India. Also, one can easily get the road transport outside the Rishikesh railway station to reach Badrinath. By Road: You can easily find the motor able transport facility to reach Badrinath from different parts of the Uttarkhand state. Regular taxis and buses are easily available to make you land at your destined location i.e. Badrinath town. Badrinath Temple: It is the most sacred and most visited site in Badrinath town. Located at the right bank of the Alaknanda River, this pious temple is dedicated to Lord Vishnu. Bheem Pul: An adventurous place with a great mythological chapter associated. As per the sources, Bheem adjust a massive rock between the two mountains to make the way easy for Draupadi. Charan Paduka: It’s a beautiful meadow that lays 3kms above Badrinath Temple. Here, you can find a boulder that carries the footprints of the Lord Vishnu that are captured when the Lord get descended from Vaikunth. Mana Village: It is the last village of Indian origin on the China border. Located at a distance of 3kms from Badrinath, the village is full of caves and the very famous Ved Vyas gufa is also located in it. Panch Dhara-Panch Shila: In Badripuri, Panch dharas are famous with the names; Prahlad, Kurma, Urvashi, Bhrigu and Indira. Similarly, five blocks or Shilas are famous around the Tapt Kund. They are; Barah, Garur, Narad, Narsimha and Markandeya. Brahma Kapal: It’s the flat platform on the bank of river Alaknanda where people perform Sradha’s for their ancestors. Herein, you can find number of pundits sitting with the ritual’s essentials. Narad Kund: This kund is located near the Tapt kund. People believe that Darshan of Badrinath are followed after taking a holy dip in this kund. Neelkantha Peak: Named after Lord Shiva, this pyramidal shaped peak is located above the Badrinath temple. Located at the height of 6560mts above sea level, this peak is the first to receive the sun rays. Tapt Kund: A Natural spring that is known for carrying hot water that beholds the medicinal values. People believed to enter the temple after taking a holy dip in the kund. Also, it is believed that the water of the Kund is powerful to cure allergies of the people. Satopanth: It is the renowned triangular lake that witnesses the arrival of almighty Brahma, Vishnu and Mahesh on every Ekadashi. Vasundhra falls: One of the renowned tourist attractions that lies in Mana Village. Here, people believed that the water of the falls is so powerful that it turns back the visitors who are impure at their hearts. Vyas Gufa: This Gufa or Cave is known after Ved Vyas, the dictator of Mahabharat did so to Lord Ganesha to get the epic written. Sheshnetre: It is the boulder that is imprinted in between the two seasonal lakes that flows on the lap of Nar parvat. The boulder gives the impression of the snake, Sheshnaag. Mata Murti Temple: This temple is dedicated to mother of Lord Vishnu. Owing to the blessings of Lord Narayana, Mata Murti gave birth to twins named Nar and Narayan. The temple is located at a distance of 3kms from Badrinath. Trekking: The visit to Badrinath avails several trekking choices for the trekkers. The thrill seekers will find the treks such as Satopanth trek, Mana trek and Charanpaduka trek, most exciting. Temple tourism: Another must to do activity for the visitors. This village holds great historical significance in the form of the viewer of the journey hailed by the Pandav during their salvation period. Badrinath’s majestic look offers the serene and picturesque view of the snow clad mountains and the greenish landscapes. The aura of the town filled with spirituality and purity lets you enjoy the unparalleled gorgeousness of the place. The sanctity of the temples lets you bow in front of the heavenly power. Visit the Badrinath shrine and Badrinath Temple and wipe off your sins and enthrall the magical charm of the journey towards the salvation.